Processions often take place before masses on Sundays and important feasts. The procession, accompanied with chants, may be made to another church (a station), for readings and prayers. The processions' hymns are sometimes assembled in a book called a processional. Made for an urban church dedicated to St Mary and with dependent suburban churches, this one may have been for Salisbury Cathedral, but one of its processions is adapted for the tradition (use) of Norwich and a procession with the relics of St Swithin suggests Winchester, too. A rare illustrated processional, it has diagrams indicating the position of participants. This diagram probably shows the blessing of a font, a ceremony carried out on the vigils of Easter (Holy Saturday) and Pentecost. 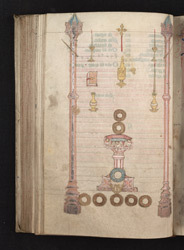 The diagram shows the priest in white vestments before the font. Behind him are five deacons. Behind the font are, from top, acolytes carrying the processional cross and candles, an acolyte with a thurible (incense) flanked by deacons holding the gospel book and pascal candle, which is dipped in the water of the font, and two deacons or subdeacons flanked by deacons holding the oil of catechumens and the holy chrism, both of which are poured into the font in the ceremony of exorcism and blessing.